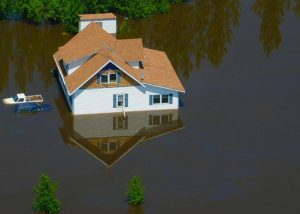 Home flooding can be a serious issue if the right steps are not taken. Unless the home is perched on a raised surface of land or on top of a hill, your home may be susceptible to flooding issues. Home flooding can lead to soaked carpeting, furniture, walls, and may even ruin the functions of home appliances and other electronics. If you are unsure if your home is protected in events of flooding. Contact a professional to properly measure the flood level of your home. We have also provided a few tips on how you can protect your home from flooding. If your outdoor equipment includes an air conditioner, fuel tank, or generator, you should place each equipment above the measured flood levels. Make sure that any outdoor equipment is anchored properly. Failure to un-anchor outdoor equipment such as fuel tanks can cause them break free and severe supply lines. Flooding can also damage sewer systems which can lead to clogging and backup. A remedy to this issue is to install an interior or exterior backflow valve. Valves should be installed on all pipes entering the house. The ground around your home can either cause flood water to be directed away from your home or toward your home. It is best that your home is built in such a way that water does not accumulate in the event of flooding. Contact your county for additional information on how you can fix this issue. Clearing gutters, drains and downspouts can be done routinely to prevent backup. Move furniture, rugs, electronics and other belongings to higher ground, Turn off any and all electronics and try your best to elevate all appliances. If you need any assistance with any flood, fire or mold remediation contact us today!